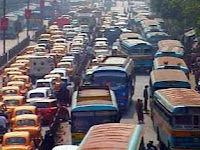 My Small World: Kolkata - Ready for the change? I was out for jogging after 4 days today and could smell the freshness in the air. It was not a co-incidence but a result of the ban on old public vehicles. Usually when I am back from jogging I could see a layer of dust on my face... thanks to the ever polluting public transport on the roads. Though they are less in numbers at that hour of the day but it is sufficient enough to kill a new born...!! What makes me feel even better...?? Generally, I find Kolkatans resistant to such changes where the effort on their part increases drastically. But this time things are different... amazing..!! I was tuned in to one of the FM stations (92.7 Big FM) during the jogging hour where RJs were interviewing masses at large on their reaction about the ban on old vehicles... to my surprise and for the first time in the past 4 years of my stay in this city, I found everyone in favor of this change. Some went on and said that we are ready to face problems due to the thin availability of public transport if we are sure of getting this change in environment consistent. Glancing at the newspaper this morning, I read quotes from old vehicle owners favoring inspite of their loss, that they too feel the difference when they are out on the road...!! What next...?? I feel now the government should expedite on take like steps for private owned vehicles too. This will ensure consistency in the effort as well as results...!! Kudos to Kolkata.... I'm sure people are changing and are ready to accept good changes with a bigggg smile...!! No doubt... if the old vehicle ban is applicable to private commercial vehicles... the same is ought to be applied on Government Vehicles too...! !